This easy slow cooker beans and sausage dish is full of flavor, and it's easy on the budget. 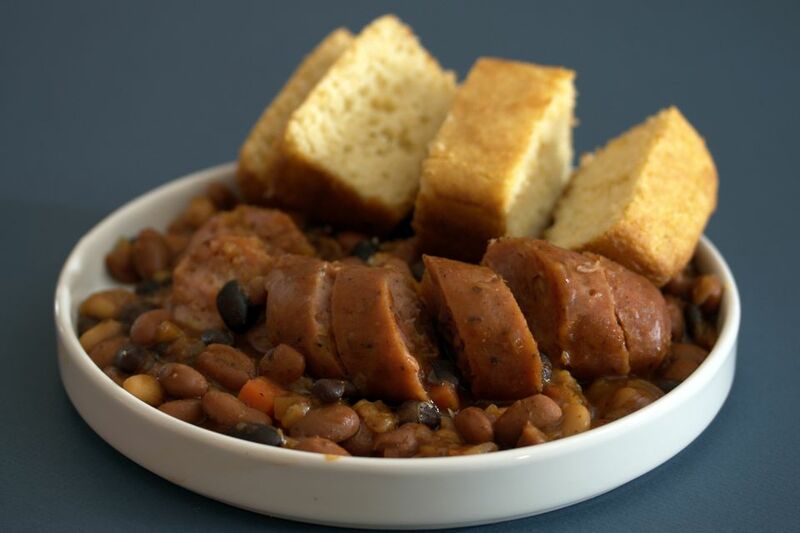 If you prefer a meat-free dish, leave out the sausage and use vegetarian baked beans instead of pork and beans. Pineapple adds extra texture and flavor to these beans, along with barbecue sauce and other seasonings. Serve these easy slow cooker beans with cornbread or hot baked biscuits for an easy and budget-friendly family meal. Cut the sausages into 1-inch pieces or leave whole. Place in the crockery insert of your slow cooker. Add the chopped onion to the sausages. In a large bowl combine the ketchup, barbecue sauce, brown sugar, chili powder, salt, pepper, and mustard. Mix well. Add the canned beans and stir to blend; stir in the pineapple. Pour the mixture over the sausages and onions and mix to blend. Cover and cook on HIGH for an hour. Reduce the heat to LOW and cook 3 to 5 hours longer. Serve with barbecue or over hot cooked rice. Add about 1/2 cup of green or red chopped bell pepper along with the onions. Add 1/4 to 1/2 teaspoon of cayenne pepper or a minced jalapeno pepper for heat. Use about 1 pound of kielbasa, cut in 1-inch or 2-inch chunks. Increase or decrease the sausage as desired, or omit it.